Unity launcher accessed by holding ⇧ Shift when starting the game.. Either by Alt+↵ Enter, from configuration file or via Unity launcher. Some animations done in ~10 FPS. 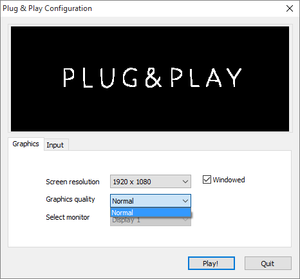 Everything excluding mouse cursor is capped at ~60 FPS. Untested with actual hardware, but playable with pointer device and single button.